Copper, iron and zinc are essential trace minerals and need to be supplemented. Copper is essential for stabilizing collagen, an important component of skin. More than 300 enzymes in our body for their activity require zinc. Zinc plays an important role in the growth of healthy skin, hair and nails. Iron is required for red blood cells for transporting oxygen. Iron is essential for a healthy skin. Its deficiency may make your skin appear dull and exhausted. The right amino acid mix repairs skin from within. They supply nutrients to nourish and strengthen skin, hair and nails from within the body. Dermatitis simply means skin inflammation, but it includes a range of conditions. The early stages of dermatitis are characterized by red, dry and itchy skin. More serious form of dermatitis may appear as crusty scales or blisters that ooze fluid. Sunburn is skin damage caused by overexposure to UV radiation from the sun. It can make your skin red and painful, which can later lead to peeling or blistering. The severity of sunburn depends on your skin type and the duration you are exposed to UV rays. The symptoms of sunburn may not occur immediately and can take up to 5 hours to appear. Acne or pimples is a common skin problem that starts when oil and dead skin cells clog up your skin pores. It is also called blackheads, blemishes, whiteheads or zits. It most commonly affects face but can appear on neck, chest, and back. Anyone can get acne but it is common in teenagers and young adults. Some women who never had acne in their growing up years may develop acne as an adult, often right before menstrual periods. The skin is one of the most essential part of your body. It provides a protective covering and protects you from a host of diseases that may endanger your overall existence! Majority of factors associated with skin damage could be prevented with simple steps. Read on to know more! Nails are composed of a protein known as keratin. Keratin grows under cuticle at the base of your nail. The section provides you all the qualities of healthy nails. The skin is the largest organ of the body, making up 16% of body weight, with a surface area of 1.8 m2. 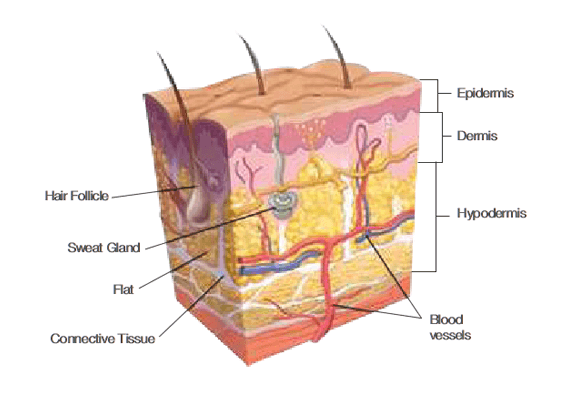 It has three main layers, the epidermis, the dermis and the subcutaneous layer/hypodermis. Skin is a dynamic organ in a constant state of change, as cells of the outer layers are continuously shed and replaced by inner cells moving up to the surface. Dermis It is the supportive connective tissue between the epidermis and the underlying subcutis: contains sweat glands, hair roots, nerve cells, blood and lymph vessels. Subcutis/Hypodermis This is the layer of loose connective tissue and fat beneath the dermis. Epidermis acts as a physical and chemical barrier between the body and external environment. Subcutis or hypodermis is a loose connective tissue layer, which is an important depot of fat. 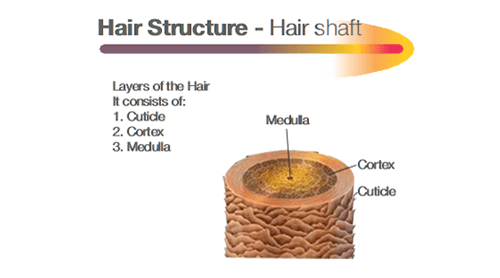 Hair is a filamentous biomaterial that grows from follicles found in the dermis. Hair is one of the defining characteristics of mammals. Hair follicle: This is the part beneath the skin. It is located in the dermis and maintains stem cells that re-grow the hair after it falls out. Shaft: This hard filamentous part extends above the skin surface. Cuticle:This is the outermost layer that consists of several layers of flat, thin cells laid out overlapping one another. Cortex:This is the middle layer that contains the keratin bundles. Medulla:This is the innermost layer. Nails consist of a dense plate of hardened keratin between 0.3 and 0.5mm thick. Fingernails function to protect the tip of the fingers and to help in grasping. The nail is made up of a nail bed, nail matrix and a nail plate. 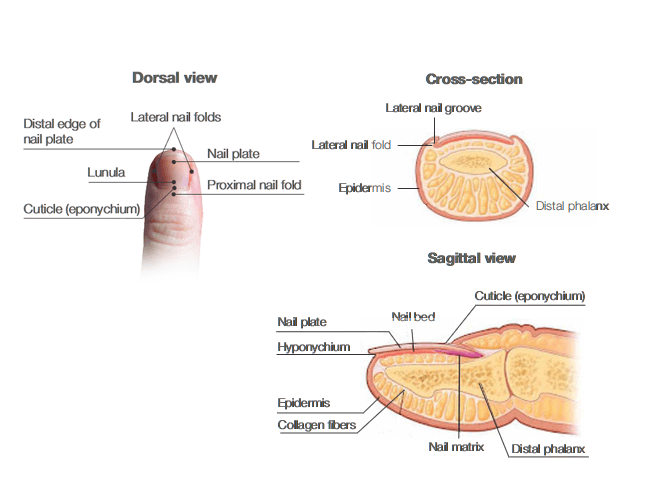 Nail matrix: composed of dividing keratinocytes, which mature and keratinize into the nail plate. The nail plate appears pink due to adjacent dermal capillaries and the white lunula at the base of the plate. Nail bed: It lies underneath the nail plate. The thickened epidermis which underlies the free margin of the nail at the proximal end is called the hyponychium. Fingernails grow at 0.1 mm per day; the toenails grow more slowly. Your skin is a reflection of your inner being. Apart from lifestyle and genetics what you consume plays a role in your skin health. Taking the right nutritional supplement will not only enhance your natural beauty, it will help minimize wrinkles, acne, inflammation and other skin-related conditions. Skin, one of the most essential organs that acts as a protective barrier to all the internal organs could be easily damaged by various factors. Majority of factors associated with skin damage could be prevented with simple steps. Read on to know more! As we grow older our skin starts showing signs of aging. Skin changes are among the most visible signs of aging. Skin changes are related to environmental factors, genetic makeup, nutrition and other factors. The biggest single factor is sun exposure. Most women hate aging. Although the effects of aging could not be avoided, they can be minimized. There are numerous ways which could help you look younger and more refreshing with each passing single day. What happens if I stop taking BIONA? The condition your skin was in before you started taking Biona tablets was the result of many years of skin deterioration. Similarly, if you stop using Biona tablets, the results you have obtained will not disappear overnight, but will reduce gradually. Can I take BIONA with other dietary supplements? Biona contains natural ingredients in doses that can be taken with other vitamin and mineral supplements. It is safe to include Biona tablets as a part of your regular diet along with vitamins, healthy foods and other dietary supplements. However, you should always be aware of the total intake of supplements. Can I take BIONA while I am pregnant or breastfeeding? Consult your doctor/healthcare provider before initiating Biona use. When should I avoid taking BIONA? If you are sensitive/allergic to any of the components of Biona, you should not use Biona and consult your doctor. What are the side-effects of BIONA? The side effects of Biona are of mild-to-moderate in nature. If you are iron sensitive person, you may experience mild gastric upset. What should I do if I miss one/ two dose of BIONA? Do not panic. If you have skipped your dose, just continue taking your recommended dose of tablets per day. Do not take two or more tablets at a time.